The dropdown problem type is a core problem type that can be added to any course. At a minimum, dropdown problems include a question or prompt and several answer options. By adding hints, feedback, or both, you can give learners guidance and help when they work on a problem. In dropdown problems, learners select one option from a list of answer options. 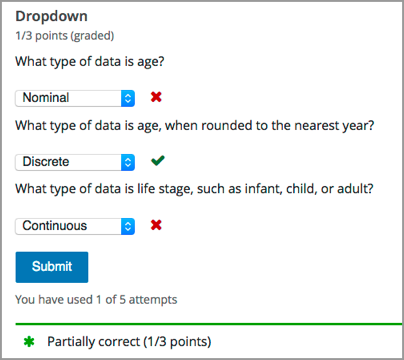 Unlike multiple choice problems, where the answer choices are always visible directly below the question, the answer options for dropdown problems do not appear until the learner selects the dropdown arrow. In the LMS, learners select a single answer option to complete a dropdown problem. An example of a completed dropdown problem follows. In this example, a single problem component contains multiple questions, all of them using the dropdown problem type. To add the example illustrated above, you enter the following text and Markdown formatting in the simple editor in Studio. Then, select Settings for the problem to define settings. To specify that each question is worth one point, leave the Problem Weight field empty. You separate multiple questions in a problem component with three hyphen (---) characters. You can separate the answer options with either comma (,) characters or new lines. The OLX markup for this example problem follows. You add dropdown problems in Studio by selecting the Problem component type and then using either the simple editor or the advanced editor to specify the prompt and the answer options. When you add a dropdown problem, you can choose one of these templates. You can use the advanced editor to identify the elements of a dropdown problem with OLX. For more information, see Dropdown Problem OLX Reference. Use feedback for the incorrect answers to target common misconceptions and mistakes. Use feedback for the correct answer to reinforce why the answer is correct. Because learners are able to guess, ensure that feedback provides a reason why the answer is correct for learners who might have selected that answer by chance. You can add feedback in a dropdown problem using the simple editor or the advanced editor. You can configure feedback in the simple editor. When you add a dropdown problem, select the template Dropdown with Hints and Feedback. This template has example feedback syntax that you can replace. When you include feedback, you might find it more convenient to use new lines to separate the answer options. <optionhint>Many people mistakenly think a tomato is a vegetable. You can add hints to a dropdown problem using the simple editor or the advanced editor. For an overview of hints in problems, see Adding Feedback and Hints to a Problem. For dropdown problems, the <problem> element can include this hierarchy of child elements. Required. Indicates that the problem is a dropdown problem. Either this attribute or a set of <option> child elements for <optioninput> is required. Accepts a comma separated list of values in the following format. correct Used if the options attribute is set. Required. Indicates which of the answer options is correct. Designates an answer option. Either a set of <option> child elements or the options attribute for <optioninput> is required. correct Required. Indicates whether the answer option is correct or incorrect. When set to "true", the choice is a correct answer. At least one required. When set to "false", the choice is an incorrect answer. If the <option> element is used, <optionhint> is a child of <option>.